The Owl B3 Mini Gel System with Built-In Recirculation combines all of the convenience and versatility of the EasyCast system with a unique buffer recirculation design that prevents the formation of pH and ionic gradients. The system is ideal for long runs, multiple sample sets or RNA gels. The system delivers clear results for samples run over long time periods. It eliminates uneven migration, band distortions or disassociation of pH dependent glyoxylated RNA molecules that can result when ionic depletion occurs. Because the recirculation system is built right into the buffer chamber, no external pumps, tubing or stir bars are required. Ships complete with Buffer Chamber, SuperSafe Lid with Attached Power Supply Leads, EasyCast Gasketed U.V. Transmissible (UVT) Gel Tray, 2 Combs: 12 and 20 Well, Double Sided, 1.0/1.5 mm Thick. Part Number B2-RL. 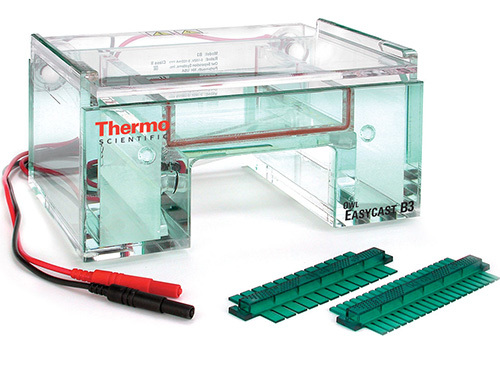 This gel tray system includes 12 slots and 12 Combs (part number B2-RL-9D). Part Number B2-RL-UVT. This gel tray system includes 12 slots.